This MOORE family history begins with an overview of the Zachariah Moore family. With roots in South Carolina, Zachariah Moore and his wife Mary Still married and resided in Walton County, GA where they reared 10 children. Some of the Zachariah Moore children migrated to Texas, while some remained in Georgia. Four brothers fought together in the Civil War. The eldest son, Robert M. Moore came to Blount County, AL in the 1860s. 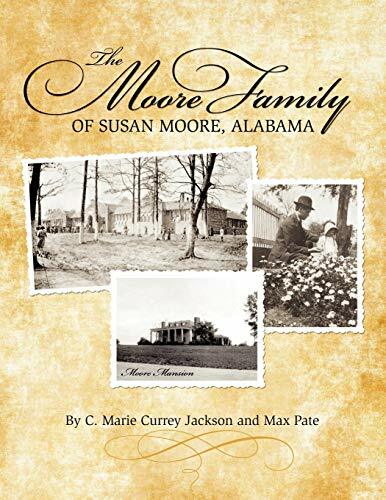 The authors present the history of Robert M. Moore and his descendants and illustrate the impact of this pioneer family through story, historical photos, and genealogy. Included among the story are numerous historical pictures of the various families, their homes, burial places, and monuments. A documentary of life on the Moore farm with its tenant homes and sharecroppers is one highlight of the book. The story of Susan Moore, the person; Susan Moore, the school; and Susan Moore, the town weaves a thread throughout the book. Marie Currey Jackson and Max Pate are graduates of Susan Moore High School and were reared in Clarence, Alabama. Both have a long standing interest in family history and genealogy. This was a joint project spanning more than year of time. Max was the main photographer of current pictures and monuments with assistance from his son Dave. He continuously proofread the copy being prepared by Marie, with the assistance of her husband, Jerry. The stories contributed were compiled and edited by both Max and Marie. Growing up together in the community of Clarence/Susan Moore, and being “first cousins, once removed” we never imagined that we would later undertake this writing!